Commonly mistaken as a blend of cloves, cinnamon, and nutmeg, allspice is actually a single herb ground from the under-ripe berry of its evergreen tree. Allspice is a popular seasoning in Middle Eastern, Central American, and island cuisines, but it offers much more than its exotic flavor. Thought to have originated in Jamaica, the uses of allspice - also known as pimento, Pimenta, Newspice, Jamaica pimento, Jamaican pepper, or clove pepper - have been traced back to the Aztec civilization, when the natives supposedly used the herb for flavoring. It was later discovered by Christopher Columbus and the Spanish conquistadors, who gave allspice its current botanical name, Pimenta, due to its resemblance to peppercorn. Today, the herb is still native to Central America and the West Indies but is gradually being introduced to new countries worldwide. Commonly mistaken for a blend of spices, allspice is actually a single plant that combines the characteristic flavor and aroma of black peppers, clove, cinnamon, and nutmeg, and it is commonly used as a condiment. However, beyond its culinary properties, the leaves and fruits of this aromatic herb also offer medicinal benefits that have been limited only to traditional practices for centuries but have recently caught scientific interest. Reducing inflammation. The anti-inflammatory and antioxidant actions of allspice can help improve arthritis, rheumatism, and other inflammatory problems. Inhibiting pain. This herb is also noted for its use as a general analgesic for inflammatory disorders. Treating digestive problems. The carminative action of allspice can help alleviate stomachaches. The allspice compounds responsible for the healing properties of the herb are polyphenols, lignins, and terpenoids. Most of the chemical extractions of P. dioica have been reported from its leaves and berries. However, the most important substance of allspice, with strong antioxidant activity, is eugenol, which composes 60 - 90% of the essential oil extracted from the berries. The presence of free radical-scavenging polyphenols also contribute to this medicinal action. Free radical damage can contribute to cardiovascular diseases and inflammation; therefore, by boosting the production of proteins that assist in regulating immune responses, antioxidants promote anti-inflammatory activity and strengthen cell membranes, among other functions. Eugenol not only gives allspice its sweet, aromatic fragrance, but also inhibits pro-inflammatory mediators and regulates pain signaling, causing an analgesic effect. In this sense, eugenol helps impede the formation of molecules that trigger swelling in inflammatory disorders such as arthritis, rheumatism, and asthma. Eugenol extract has also been found to promote the activity of the protein-digesting enzyme trypsin. It is secreted by the small intestine during meals. When activated, trypsin helps the digestive processes that convert food proteins and complex carbohydrates into amino acids for absorption, producing carminative effects. Jamaican allspice's essential oil contains 80% of eugenol, and it is considered the most potent variety of the herb. Turmeric and cat's claw are well-known anti-inflammatory herbs, particularly useful for joint pain, while cardamom, chamomile and cloves provide similar carminative benefits. When consumed in normal dietary amounts, allspice is considered safe. Excessive oral consumption - such as in heavily-spiced dishes - may cause mild heartburn. When applied topically, allspice may cause an allergic reaction in those with sensitive skin. There is not enough reliable information to warrant allspice safe for women who are pregnant or breastfeeding when used medicinally. Those with bleeding disorders or an upcoming surgery should not use or consume allspice, since its eugenol content can inhibit proper coagulation. For the same reason, people taking blood clotting medications should avoid consuming allspice. Jamaican pepper berries are a dark, reddish-brown color with a clover-like odor and strongly aromatic taste. Many Central American and West Indian cultures use allspice for a variety of remedies. When flavoring beverages and foods, use allspice sparingly, as it is very potent. For example, for soups, stocks, or marinades, only 1/8 teaspoon (62 mg) of ground allspice is needed to flavor two quarts (1.89 L). Dried. The unripe allspice berries are often dried and ground to be used as a condiment in a variety of culinary preparations and commercial products, from baked goods and ice cream to ketchup, spice blends, and cured meats. It is an essential seasoning in Jamaican jerk foods, which are also flavored by the smoke of allspice wood fires. Infusion. The leaves and berries of allspice can be steeped in hot water and are traditionally taken to relieve colic, colds, dysmenorrhea, dyspepsia, and flatulence. Allspice is also known to be used as a stimulant and overall depurative. Decoction. Jamaicans traditionally boil allspice berries, and the concentrated liquid is taken for treating ailments from colds to digestive discomfort. Poultice. In Belize, allspice berries are traditionally crushed to make a paste for topical use on foot fungus and arthritic pains. Liquid extract. Allspice liquid extracts are consumed to help aid with digestive functions. Essential oil. The warm, sweet, and pungent aroma of allspice essential oil is obtained by a distillation process, and it is used only for topical application and diffusion. Three drops must be diluted in an ounce of carrier oil before application. This preparation is thought to relieve stiffness and joint pain, as well as soothing stomach aches. Ointment. An allspice ointment is believed to have anesthetic effects and is also used for the topical treatment of rheumatism and neuralgia. Tincture. The crushed parts of the plant are covered by a neutral alcohol, such as vodka, and after few weeks of maceration, a concentrated form of the herb is obtained. This preparation is easy to make at home and can be used to treat gastrointestinal problems. Two or three drops must be dissolved in a glass of water before ingestion. Capsules. The dried and powdered allspice berries can be found encapsulated, in fixed doses, and are easy to ingest in order to relieve flatulence, indigestion, and other gastrointestinal issues. As a supplement, one or two capsules with a glass of water, before eating, is the recommended daily dose. Whole or powdered allspice is available year round in most grocery stores and supermarkets worldwide. The herb is used extensively in Middle Eastern and Central American cuisines, as well as in a variety of European pastries. Select herbal shops, specialty health food stores, and online retailers are most likely to be the best places for buying allspice supplements, such as liquids extracts, tinctures, and capsules. Allspice trees thrive in hot climates with moderate rainfall. They grow best in well-drained soil. In Jamaica, which is one of the tree's native areas, allspice grows best on limestone hills near the sea. Allspice grows well in semitropical lowland forests, well up to 3,300 feet (1,000 m) above sea level, with an average temperature of 64 - 75°F (18 - 24°C). Allspice is traditionally propagated through seeds, but it can also be grown from cuttings in order to get true to type plants. Fresh ripe berries are collected from high-yielding female trees and soaked overnight to obtain the seeds by rubbing the fruits in order to remove the pericarp. Allspice seeds must be planted as soon as possible because they lose their viability almost immediately after being harvested. The beds for the seeds must be 6 - 8 inches (15 - 20 cm) high, 40 inches (1 m) wide, placed in an area protected from direct sunlight. The appropriate medium for growing allspice seeds must be composed by loose sandy soil, over which a layer of sand of about 2 - 3 inches (5 - 8 cm) is spread. Seeds should be sown with a spacing of 0.8 - 1.2 inches (2 - 3 cm), and at a depth of 0.8 inches (2 cm). In order to succeed, allspice seeds require regular watering. After 9 - 10 months, the allspice seedlings will be ready to be transplanted. Although allspice can grow on a wide range of soils, a well-drained, fertile, loam limestone soil with a pH of 6 - 8 is ideal for this plant to thrive. In the tropical regions where allspice is cultivated, the trees grows well with an annual rainfall of 59 - 67 inches (1,500 - 1,700 mm) throughout the year. The flowering and fruiting season is from June through August. Trees will be ready for harvest within three to four years of planting. Berries are picked when they are full-size but before ripening, where they are subsequently sun-dried and then processed or sold. Detailed information about growing allspice can be found in the herb garden section. 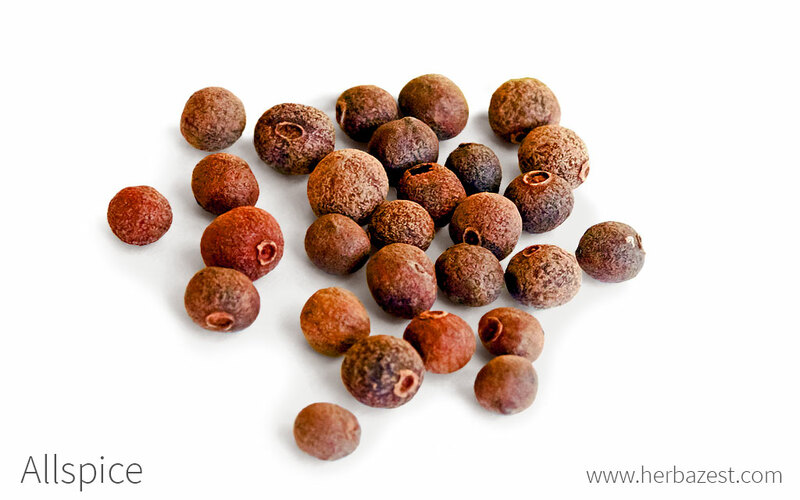 Unlike the common black peppercorns, which are fruits from tropical vines native to South Asia, allspice is an evergreen tree that grows 22 - 43 feet (7 - 13 m) tall with light gray bark and dark green, aromatic leaves that are 1.5 - 3.0 inches (4 - 8 cm) long. The small whitish flowers that grow on the tree in the summer produce berries that are 4 - 5 mm in diameter. The berries are picked when green and sun dried. After dried, the seeds are reddish-brown and look like peppercorns. Allspice, or Pimenta dioica, belongs to the family Myrtaceae, which includes cloves (Syzygium aromaticum) and guava (Psidium guajava). When Columbus discovered the herb in Jamaica, in the beginning of the 16th century, he gave it the genus name Pimenta, from the Spanish word "pimienta," for peppercorn. The species name dioica comes from "dioecious plant," meaning the male and female reproductive parts grow on separate plants. While the genus Pimenta consists of about 18 species of aromatic shrubs and trees, all native to the tropical regions of the Americas. P. dioica (allspice) is the most commercially-important species of the genus, but is closely related to P. racemosa, also known as bay rum tree, which provides "oil of bay." Allspice is said to have been used by the ancient Mayans in embalming procedures, as well as to flavor chocolate and as a digestive aid. However, the spice was formally discovered in the West Indies by Spanish explorers around the beginning of the 16th century. By the 17th century, allspice was used by pirates to barbecue their meat before going on voyages through the West Indies. They endowed the name boucan to the meat, coming from the French verb boucaner for barbecued or cured. In this way, pirates became known as buccaneers. In 1601, the spice was exported to Europe as a substitute for cardamom. The British bequeathed the herb its ultimate name, allspice. Today, allspice is dispersed worldwide. Whole allspice is indigenous to Central America and the West Indies. The world's largest exporter of allspice is Mexico. Jamaica was the top global exporter of allspice in the 1990s, but has since been surpassed. In terms of crop quality, Jamaica is renowned for its spice's exceptionalism due to high levels of essential oils. Mexico's comparative advantages for its largest customer, the United States, are its low costs, high production values, and proximity. The United States also imports allspice from Honduras, Guatemala, and Jamaica. Cosmetics. Allspice is used as an oil source for perfumes and cosmetics. Candles. The scented oil is also used in candlemaking. Food industry. The extracts from allspice leaves have been used as a food preservative, to keep meat and poultry fresh and sterile. Allspice oil is used to flavor beverages, candies, chewing gums, liqueurs, meats, and sauces. Pesticides. These essential oils have been substituted as a natural alternative for pesticides and fungicides as well. Carpentry. Allspice wood is used to make umbrella handles and sticks. Alcoholic beverages. The liqueurs Benedictine and Chartreuse contain allspice flavoring, as well as Allspice Dram, also known as Pimento Dram, a liqueur made in Jamaica. 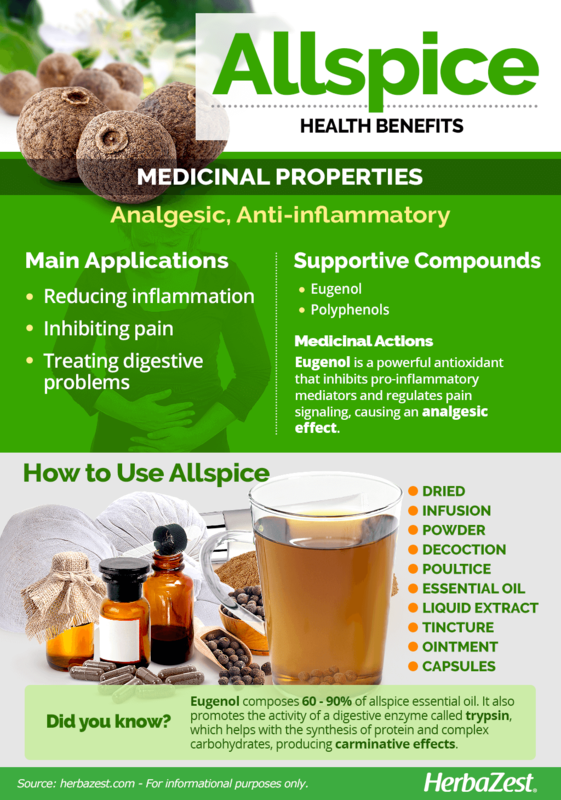 Said to combine the flavor of a variety of different herbs, allspice is known worldwide for its utility among a variety of cuisines and beverages, as well as its use medicinally. Its carminative, analgesic, and anti-inflammatory effects have helped this herb gain popularity over the past years.